California Governor Jerry Brown likes to talk a good game on climate. He speaks often about climate action and science, and describes himself as a sort of “Anti-Trump” on climate action. As a centerpiece of that plan, Brown has invited governors and Mayors from around the world to California Next month for a Global Climate Action Summit. But there’s a fundamental problem with Brown’s climate talk – he’s never been willing to stand up and stop fossil fuel production in his own state. California extracts about 200 million barrels of oil per year, and Brown has frequently helps the Oil and gas industry get new permits, and allows them to drill very close (within a few hundred feet) of vulnerable communities – especially children, the elderly and communities of color. For the sake of the climate, to protect our communities, it’s time to say “Enough!” It’s time to escalate and make our message impossible to ignore. 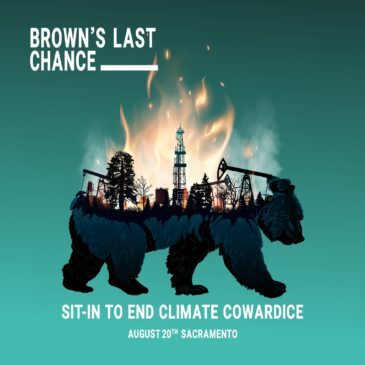 Will you join us on August 20th in Sacramento as we SIT IN to demand that Governor Brown STAND UP to big oil? Brown’s climate leadership is not sufficient to address climate change in California, and is not a model of leadership for the world, yet. The global warming pollution from existing wells and pipelines will take California far beyond safe climate limits, and Brown isn’t doing anything to stop new wells from being fracked either. Our allies are leading a non-violent direct action to insist that Brown address our concerns, acknowledge the science around extreme extraction and neighborhood drilling, and enact adequate protections to save our communities. Commit California to a managed decline of fossil fuel production beginning with 2,500 foot setback limits to protect frontlines communities from toxic oil and gas drilling, as part of a just and equitable transition away from fossil fuels. Event Details: (full details provided upon confirmed sign-up) Sign up to sit in to end climate cowardice!